My friends used to call me ‘The Packet Mix Queen’, my life is so different now….. I am a ‘stay at home mum’ with a wonderful husband and two lovely daughters aged 18 and 16. We live on an ordinary street, in a 1930’s semi-detached house in Leicester, UK. When I first started to write my blog in 2012 I had four allotments and grew most of my own fruit and vegetables, however due to circumstances and a new reactive RSPCA dog called Judy I had to give up my allotments in January 2015. I am now converting my small back garden into a vegetable patch with the intention of growing as much as possible in it. I make my own bread and cook from scratch whenever possible. I make jam, pickles, chutneys, apple juice, etc. and I clean the old fashioned way using vinegar, lemon juice and bi-carb. I learnt my frugal, thrifty ways through necessity and the desire to make sure my family do not feel deprived in anyway. I try to make sure WE LIVE WELL FOR LESS and would love to share with you how I do this. There are lots of posts on my blog about my old allotment and now I have lots of posts written about growing fruit and vegetables in a small garden, so hopefully there is something for everyone to read. Looks very interesting and shall definitely be following regularly for top tips and ideas. Anything to do with saving money whilst being healthy and organic is greatly welcomed by us! Hi, just popped over from the Down to Earth forum. Your blog sound like it’s going to be so good. Thanks for your support. I hope you enjoy it. Love your new blog and I love your philosphy. Home-making is an art. Congratulations on starting your blog. I look forward to reading your posts. Thank you for your kind words, I hope you enjoy reading it. I just wanted to let you know I am loving your blog. It is so much in tune with what I am trying to do even though we are on different sides of the world, I work full-time with no kids at home and live on a small acreage. Best wishes and I will definitely continue reading. Thank you. I think it’s wonderful that we can share in each others lives even though we are on different sides of the world. Isn’t technology wonderful. Thanks for visiting my blog. Best wishes on your blog, it already has many interesting topics. I also like to be chemical free when it comes to cleaning products, use a lot of vinegar, lemon and bicarbonate, make my own laundry liquid and soaps. Hi Sami it’s lovely to hear from you. I don’t make my own soaps but when I get time I want to give it a go. Hope you will visit my blog again. Thank you Sydney for taking the time to read my blog and comment on it. I’m glad you liked it. Interesting to find someone else with multiple plots – we have five. It’s lovely to hear from you Sue. I’ve just had a quick look at your blog and it’s very interesting. I’ll sit down later and have a good read of it. Hi Rosalyn, it’s lovely to hear from your. I find that interesting too and love to read blogs from all around the world. I hope you enjoy reading my blog as much as I enjoy yours. I can relate to your changes, I was known as the junk food queen. I could live on a bag of Doritos and pop for a week as I was too busy working 2 -3 jobs to stop long enough to make a proper meal. Now, I can’t stand the taste of them, it’s like eating cardboard and make all my meals from scratch, pop/soda is no where to be found and water is my main drink. I’m having fun looking around your site. Hi livingsimplyfree, lovely to hear from you. Yes we definately have something in common don’t we. Homemade food tastes much better doesn’t it and it can be so quick and easy to make and it saves you money too. I just took over my allotment recently and will be following your blog … it’s great! Hi Elablue and welcome. Glad you have enjoyed my blog. If you have any questions about growing any veg, please ask as it can be daunting when you first take over an allotment, or if there is anything in particular that you would like me to write about just say and I’ll do my best. What is your allotment like, is it overgrown? Nice to meet you, Catherine C.
Hi Catherine, lovely to hear from you. Your blog looks fab and i’m going to get a nice hot chocolate and give myself time to read it for a treat. Look forward to hearing from you. Yes every month there will be more to write now lol. I so look forward to Spring. I am so pleased I can offer you the Liebster Award to support your brilliant website I hope you enjoy this historic prize. http://lizard100blog.wordpress.com/2014/02/13/210/ it’s an award for new bloggers and I know your blog is quite well established but as a new blogger I want to interpret this as an award that I can give to those who inspired me to start. Thank you. Thanks silverbells2012. Looking forward to your comments too. Don’t mind me asking but how exactly did you get four allotments? I’m on a waiting list to get a single one, is there a trick you recommend? I am very lucky Merveilles as our allotment site is one of the few that has hardly ever had a waiting list and even at the moment there are loads free, so I was able to have four. There is a one man on our site that has more plots than me too. It’s such a shame as I would rather have less plots with all the other plots taken on our site, but this hasn’t happened so far and probably never will. I think if people weren’t allowed more than just one plot each then the committee wouldn’t be able to justify keeping the site open and i’m sure the council would sell it and we would end up with houses built on it….which is what the council did to half the site about 15 years ago. 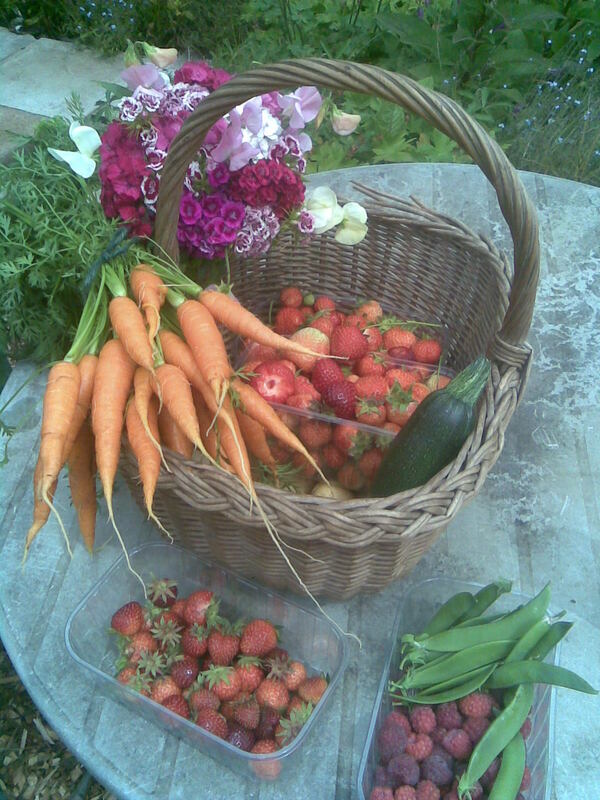 Hi ‘thedevinepeach’…how wonderful to get an allotment and start to grow your fruit and veg there. There is loads of info on my blog re allotment growing so enjoy having a good read. You are so right to do a bit at a time. Sadly, due to circumstances beyond my control, I had to give my four beautiful plots up in January this year, but I have created a nice kitchen garden at home instead now. I love new blogs, I look forward to reading it. Your rag rugs look amazing! Thank you… now to get over the initial trepidation and just get on with it. Hi Steve, lovely to hear from you…..I’m not surprised your wife refused to eat your veg after that lol (reading it though did make me giggle)….I have fenced mine off so that doesn’t happen. Half a plot is great to have….I really miss my allotments and so miss the peace and quiet there. I love your blog! You are a woman after my own heart. I suspect I’m a bit older than yourself, I’m 58, but my life now is similar to yours. I now only work part time due to my husband’s health, he has Parkinson’s, but am the proud owner of an allotment, only aquired in June last year – steep learning curve! I’m a chef by profession so live making everything from scratch. My new part time life now allows me to make jams, chutneys and bread again. Look forward to reading more blogs! Welcome to my blog Isobel, there is a lot for you to catch up with …so a nice cup of tea is in order while you read lol. I love to hear what people have been upto so pls leave comments when you can. I’m sorry to hear about your husbands ill heath, how are you coping with this? I hope you have family around to help? There really is nothing as nice as homemade jams and chutneys and when you have grown the fruit and veg yourself it makes it even better. Keep me updated with your allotment as I so love to hear what people have been growing and what did well and what didn’t. I’m so pleased you’re back! I’m not an internet/ blog/ Facebook/ twitter…etc fan but I came across your website when searching for information about growing vegetables a few months ago. I dip in and out but you are now firmly pinned onto my ‘favourites’ page. The advice you give is fab and so straight forward and I just can’t believe you have time to do all the things you do each week! Thank you for your kind words KP and taking the time to read my blog….I am so glad you find my blog easy to understand, as that is exactly how I want it to come across. Hi Mrs G…I used to cycle to Bradgate Park as a child, it is so beautiful there. I enjoyed reading your lovely blog, well done!! Hi Sharon, you life sounds exactly like mine – menopause and all. The brain fog is the worse I think and I have to write everything down now or I forget important things lol. Yes my children are younger, but I had them when I was 31 and 33 and they are now 18 and nearly 20. Aging parents are very hard work and unfortunately dementia is hard to deal with and is taking up a lot of my time. I have decided to post the odd few things on my facebook page now just to keep in touch with the lovely people who used to read my blog, until such time I can start to write properly again (I dearly miss writing blog posts). So hopefully you have facebook? I really hope you have a happy Christmas and a much happier New Year Sharon. Oh hello, what a lovely suprise as I have just sat down to write my Christmas cards and glanced at my emails to find this one from yourself. I do have facebook so I will endeavour to find you even though I am bit of a techno-thicky. My heart goes out to you as yes, alzheimers & dementia are simply horrible to contend with. I fear from recent tests that my step-mum has had, the results will show that she is a victim too bless her. On a more positive note I was a bit like you a while ago being a packet queen myself, opening cans and jars too, however, I am now cooking everything from scratch where possible and have mastered making my own soup……it’s delicious! Take care Mrs Thrift and hopefully I will find you via facebook.